ActBlue Raises $100 Million For Democrats In August - Joe.My.God. 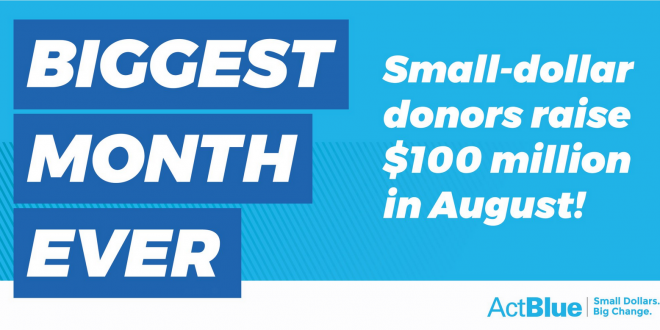 The online fundraising platform ActBlue raised $100 million in August for Democratic candidates, marking their biggest fundraising month since they launched in 2004. Why it matters: Liberal activists and donors are showing no signs of slowing down before the 2018 midterm elections. Some of the candidates who benefit most from ActBlue’s fundraising include Beto O’Rourke running for U.S. Senate in Texas, as well as Democratic gubernatorial candidates Stacey Abrams in Georgia, Andrew Gillum in Florida, Tony Evers in Wisconsin, Rich Cordray in Ohio, and Gretchen Whitmer in Michigan.